The Food Cupboard typically serves over 300 families per month. These families can be referrals from agencies or people who visit the Cupboard because they heard about us by word of mouth. Families seeking assistance are screened to assure they qualify through proof of residence (MUST BRING ONE PIECE OF MAIL DATED WITHIN 30 DAYS AND PHOTO ID FOR EACH PERSON LIVING IN THE HOUSE 18+ OR OLDER) in one of our coverage areas, then are given the opportunity to select groceries from the shelves at the Food Cupboard. 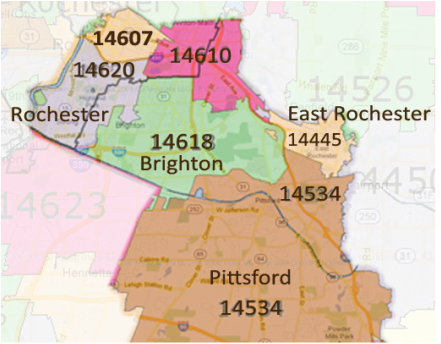 Our customers come from residences located in eight zip codes which covers a portion of Rochester, Brighton, East Rochester, Mendon, Honeoye Falls and Pittsford. Some local businesses and sports teams provide food staples on a monthly basis and many individuals donate food or money. Summer often brings a heavier demand because children who qualify for free breakfasts and lunches at school do not receive those two meals during summer break. Consequently, the resources provided by the Food Cupboard are needed year round. PFC relies on a staff of more than 100 volunteers. They work in a variety of positions, stocking shelves, interviewing families, and performing a host of other jobs.